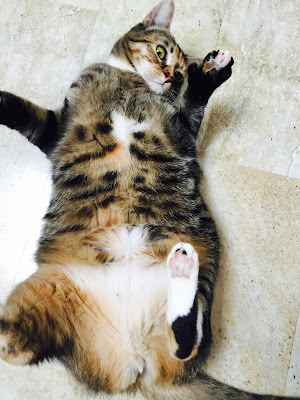 The Itty Bitty Kitty Committee: THREE Dinichi Updates! Remember the Dinichi family? They were with us during the last fundraiser and I know they were loved dearly by the whole IBKC community. 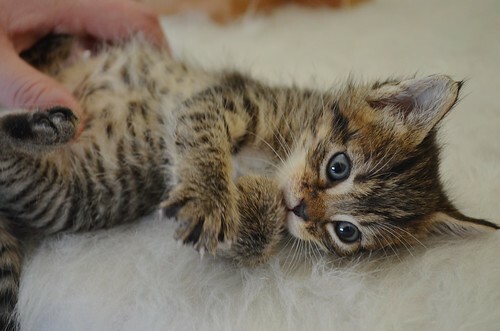 No surprise -- they were absolutely adorable AND there were a couple of polydactyls in the pack. We love our polys 'round here! I'm so excited to share updates on three of our four Dinichis today. First up, handsome Russle "Spud" Dinichi. Here he is as a young lad. Here he is now! MY GOODNESS! Look at those giant lobster claws!! Here's an update from his mama, Lisa! 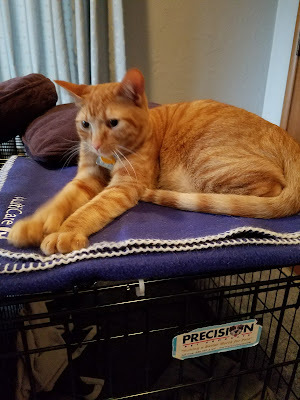 I have always been intrigued by ginger kitties and it was always my hope to be owned by one, but there was never one available when our family was thinking of adopting a kitten. 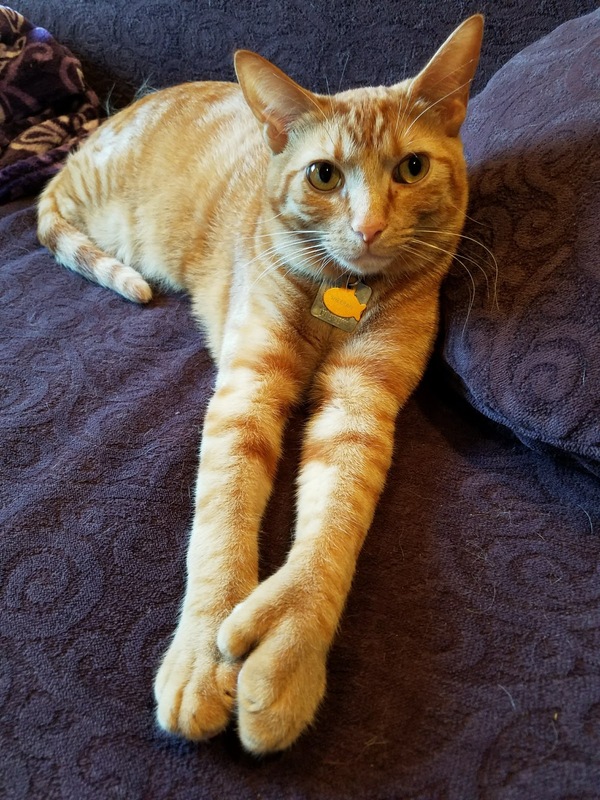 So, a little over a year ago, a beautiful ginger polydactyl boy popped up on the Itty Bitty Kitty Committee Blog. My family notified me of this and I was strongly encouraged by my hubby and daughter to throw my hat in the ring. 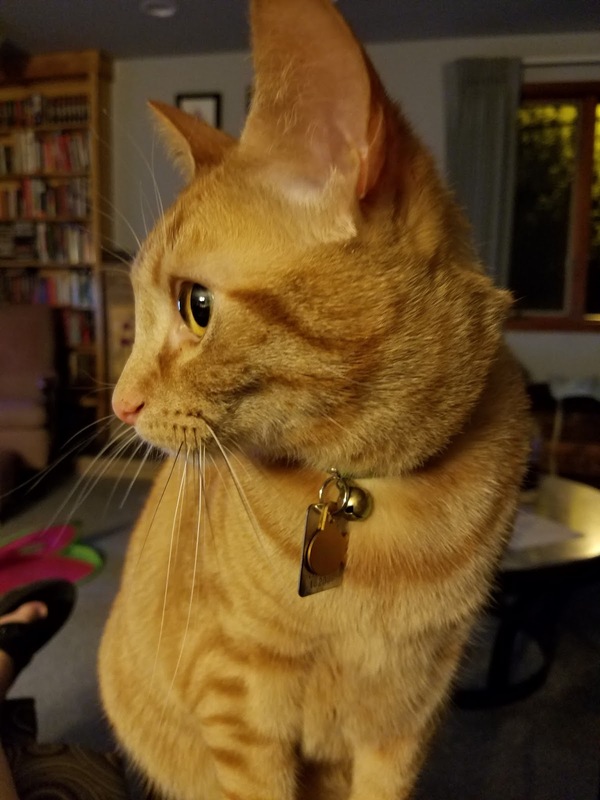 I was reluctant, given that we already had a 70-pound dufus dog (Stanley, about 10 years old) and a pair of brother cats (Jack and Louie, about 9 years old) that ruled the roost. I was reluctant to upset the delicate household balance. However, I contacted the IBKC, gave our story, and threw my name into the hat to be potentially owned by this little ginger boy. I recall with great excitement the email from IBKC saying that we were the chosen family. 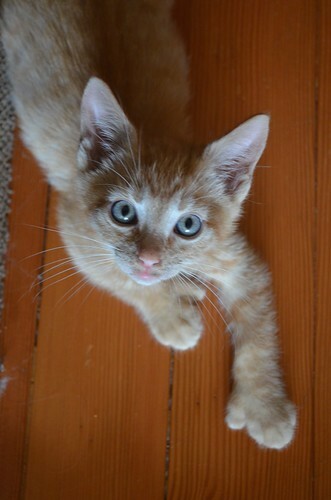 Russell was tiny (in the neighborhood of 2 pounds), absolutely handsome and charming as could be. 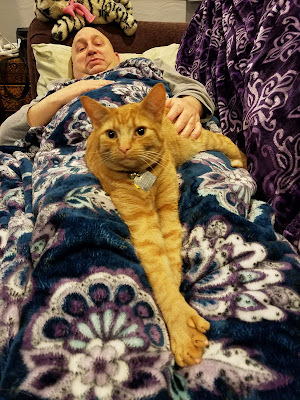 The first few days that Russell was home were spent in our “mancave” with hubby who was recovering from surgery. They quickly bonded over the SyFy channel and their mutual love of cuddling on the couch for hours on end. The first meeting between Stanley and Russell resulted in Russell becoming a huge “bottle brush” (it is amazing how big tiny kittens can make themselves!) The first meeting with Jack and Louie didn’t go much better. I truly wondered what we had gotten into. However, Russell grew quickly in confidence and size, and now outweighs one of our older cats by 5 pounds. He is 13 pounds now! Besides his favorite, well-loved sparkle ball, one of our older cats is his best friend. 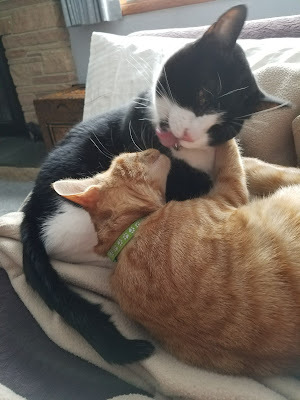 They wrestle and chase each other all over the house. When he’s not playing with Louie, Russell can be found chasing his ball all over the kitchen and living room, using his big mitts to bat the ball away (his soccer skills are just as impressive as you would expect they would be), just so he can pounce on it. When he’s not playing by himself or with the older cats, he can be found suckling on any soft blanket, before finally taking a long, well-deserved nap. Russell’s relationship with Stanley has improved immensely as Russell has matured. While Stanley is still too big for Russell to play with, he will gladly accept any licks that Stanley will give him. Stanley loves his kitten too, and has taught Russell how to beg for food. 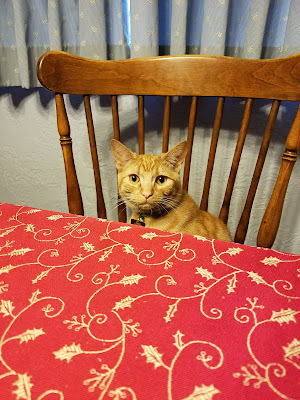 I have never met a cat so food-motivated, but he will do just about anything for a treat. Thank you, Laurie, for our little ginger baby. We love him! Next up, we have the adorable Tegan Grace Dinichi. 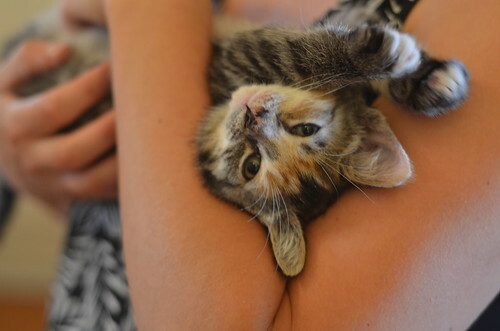 Above is a picture from her adoption day. Below, a nice bunch of pics and an update from her mama, Tanya. I wanted to share an update on how Zoya (formerly Tegan) is doing. It's hard to believe it's been nearly a year since she has joined our family. She is a little nut and she is the best! 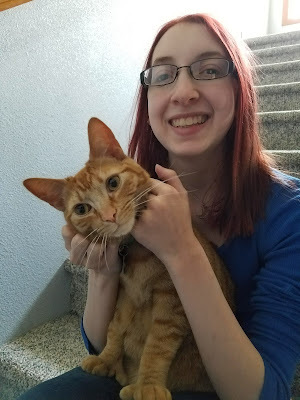 She was a very goofy and clumsy kitten and that has not changed - sometimes when she is playing with a toy and trying to kick it with her back legs, she'll kick herself in the head instead. She spends a lot of time doing "the seal" - just laying on her back, looking around. She purrs constantly - just making eye contact with her is enough to get her motor going. She still has the adorable high-pitched squeaky purr she had as a baby. 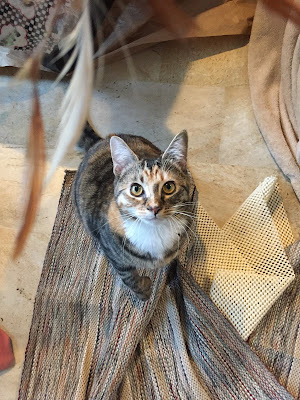 Her favorite things are playing with us and the older kitties, spending time in the catio, chattering at birds and squirrels, hunting flies (she's very good), and treat time. She doesn't have the best biting manners - in fact her early nickname was Shark Face - but it's getting much better with time and training. She is starting to like snuggling a bit more, with us and the two older kitties. She is very social, and follows us from room to room. Her thumbs have developed well! She still has goofy lobster paws, but we haven't had any issues with the claws, which we keep trimmed. Thank you so much for raising this goofball, we can't imagine life without her! Here is the update on Lucy... She is a spunky little (not so little) kitty who has totally adjusted to being a girl. ha ha. Seriously though, she and Holly have fallen into a mutual tolerance and daily "kitties gone wild" chase. Every so often I even find them all curled up together and I consider that GREAT progress. Lucy loves to hang out on the deck and bird watch. She is also quite the foodie and has gotten a bit chunky so we are working on that. She still purrs so loud it sounds like a lawn mower and loves a good tummy rub. I just love having her in my life and I want to thank you for fostering her and socializing her so well. I attached a few photos. The one of kitties in the dryer was well supervised. : O Lucy is in the back, Holly in the front. Dear adopting families, thank you SO much for taking the time from your busy lives to share the stories and photos too! We love your kitties and it is always so wonderful to see your beautiful babies all grown-up and hear how well they are doing. 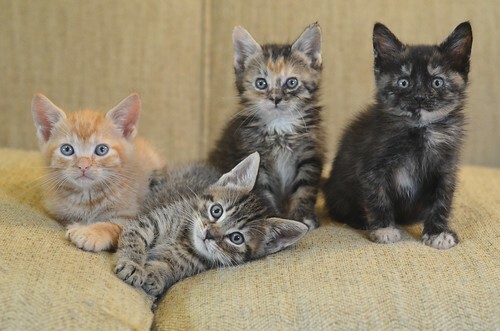 We appreciate you sharing your kittens with us! THANK YOU! My heart is full reading these updates on the graduates. It's great to see the Dinichis grown up. I love the photos of Zoya and Lucy laying belly-up. They really are sisters. Does Russell usually join the family at the table? Well Spud is quite the Handsome Dude! Well done, Russell. Zoya's belly rub trap is adorable and Lucy's belly spots are still delish! Thanks for the updates. I loved Tegan- but now she is named after my favorite nail polish! It's a win-win. Tabbies are eating machines, so the food motivations are no surprise. I love these descriptions of these wonderful cats. I can almost hear other readers nodding their heads thinking "oh yeah, my cat does that". 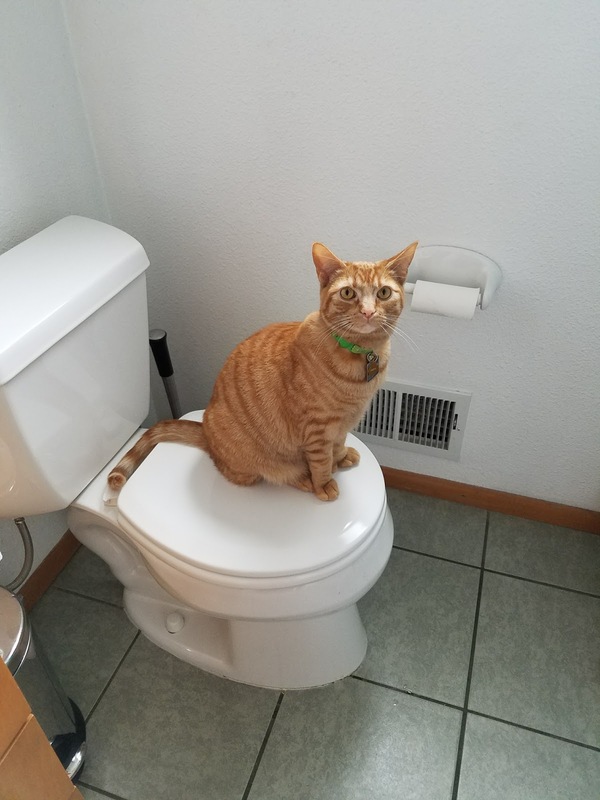 Spud is obviously the king of all orange tabbies. He looks magnificent! Your kitties find the nicest families! They are all gorgeous! It's awesome to hear about their fabulous homes and their wonderful lives. Many thanks to each of the families of these three diNichi kittys. Each are gorgeous and well loved which is a happy thing. I am partial to Poly kitties, since I had one in my life for just short of 15 of her 16 years. We would hold 'hands', share a pen as a gripping toy and she played fetch with a superball as a young lady. My day is made...where is my tabby boy? "sometimes when she is playing with a toy and trying to kick it with her back legs, she'll kick herself in the head instead." Hahaha! I can't even see how that works! Oh my. And cats who are usually so graceful! Haha. So is today the actual anniversary, the 15th? wonderful updates, thank you so much. The girls are of course beautiful but Russell - SWOON! He's so orange! And big! What a lovely guy.